Four of the best youth international basketball nations at U20 level are participating in the international basketball tournament in Noia, Spain (Torneo internacional de las selecciones femininas sub veinte en Noia) as part of their preparation for the U20 European Championship for Women. The French roster for this competition was not officially communicated but the following three players from the original 2013 France training roster after the youth international basketball event in Fougères have been released: Carla Blatrie, Lola De Angelis and Margot Joret. In addition Sarah Ousfar did not make the trip because of a nagging injury that required her to rest for a few days. For Grégory Halin, the head coach and his assistants Damien Leroux and Abdel Loucif this is the last preparation tournament before travelling to Turkey at the end of June. Aziz Akkaya (in picture) who coached the Turkish U20 team to a bronze medal in 2012, is again responsible for the U20 programme this year. He has been busy with trips to Sweden and Ukraine this season. Another familiar face for Halin is that of Spanish head coach Anna Caula who is in her second season as head of the U20 programme. This competition is the Spanish team's first youth international basketball encounter of the season. Russia U20 have a different head coach this year, Andrei Dolopchi. France blew away Russia (83-61) in the first game of the tournament. The damage was done early in the first quarter with France leading (13-0) with just under six minutes played. By the the end of the first quarter France's advantage had grown to more than 20 points (26-8). For the rest of the match, both coaches rotated their players frequently as they tried things out. For France Ester Niamke top scored with 14 points while Marie-Bernadette Mbuyamba was the only other player in double digits with 10 points. The Russians were led by Ksenia Tikhonenko and Maria-Margarita Davydova with 13 and 12 points each. In the second game, the fans were given a treat as Turkey edged out Spain (69-63). Turkey already looked like a well oiled machine and once they hit their free throws more regular they should be a force to reckon with later in the summer. Spain were a little slow out of the starting blocks and allowed too many rebounds to escape them early on. By the the time they corrected their errors Turkey had the advantage. 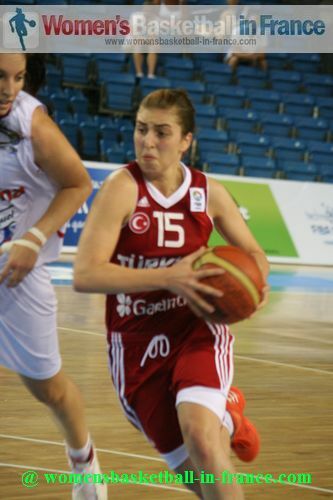 Ayçe Cora (in picture) from Turkey was the star of the match scoring 22 points and dishing out 4 assists. She showed her full range of offensive skills which included 3-from-4 shots from beyond the arc hitting the target. Olcay Gakir was the other big hitter for Turkey with 11 points. 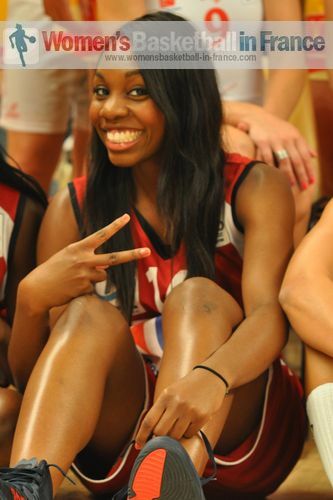 For Spain Astou N'Dour and Yurena Díaz did most of the scoring with 16 and 15 points each.